If you’re like me, you spend a lot of time using your Mac, covering everything from work to play. In my case, my machine not only helps me create my various Macworld features, but it also pays the bills, writes letters to friends, updates our family’s website, and can occasionally be found driving a race car or sneaking in a virtual round of golf. Given how much time all of us spend on our Macs, it makes sense to make that time as enjoyable and productive as possible. After all, there’s no law that says you have to use your machine exactly as Apple delivered it, right? From customizing your Mac’s appearance, to teaching it some new tricks, to increasing your productivity, there are a number of things you can do to get the most out of your time with it. The following Visual Tweaks, System Enhancers and Productivity Boosters are examples of some of those things. You probably won’t implement everything, but this collection of tips and tricks should provide a good sense of those things you can do to customize your Mac and improve your productivity. Keep an Eye on the Planet If you work in a windowless cube, deep within the bowels of an anonymous office tower, there’s no reason why an entire work day should go by without you ever laying eyes on the great outdoors. Your Mac can help you get a glimpse of the big, wide world that’s out there. If you want the high-level view of things, install TerraVista. This free app places a floating image of Earth on your desktop, reflecting the current sunlight coverage on the planet—and even optionally showing cloud cover. You might also like Gary Martin’s EarthGlobe (also free), which does something similar. You can’t use as large an image of Earth, nor can you see current cloud cover, but an Info window gives you some interesting Earth and sun data. If you’re more of a Moon fan, try another free Gary Martin offering called MoonDock; It does similar things, but with the moon instead of the sun. Using EarthDesk, you can turn your desktop into a virtual satellite view of the planet—day and night boundaries and cloud cover are both updated regularly. 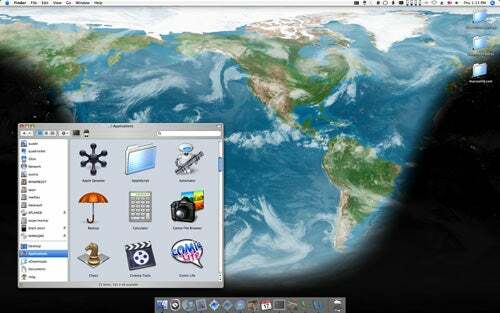 Xeric Design’s EarthDesk ($20) offers a more detailed solution, turning your desktop image into your window on the world. Instead of your normal desktop picture, EarthDesk offers a flat projection of Earth’s surface, complete with cloud cover (updated every three hours) and dark and light zones that update as the day progresses, The program lets you add custom locations, which you can jump to later to see their current conditions. You can choose from 11 different methods of projection—that’s the method by which the round Earth is transferred to a flat map—and view either a traditional satellite image or one showing state and country boundaries. You can even choose to use EarthDesk images in your screen saver. Make Your Laptop’s Screen Transparent Well, not actually transparent—but you can make the screen appear that way with a bit of visual trickery. First take a picture of the area behind your laptop, from an area near where you’d be looking at the screen. Open that file in an image editor, and crop it to exactly your screen dimensions—1440-by-900 on the 15-inch MacBook Pros, for instance, or 1280-by-800 on a MacBook. Use the Desktop & Screen Saver System Preferences panel to set this image as your desktop. Finally, carefully position your laptop so that the image appears continuous with the actual background behind it. In practice, this doesn’t work nearly as well as it looks in still photos—such as these in a popular Flickr group. As you work and your head moves around, you’ll probably find the mismatch between your desktop and the actual background to be distracting. But it’s a great trick to use if you’re going to walk away from your desk for a couple minutes. Beautify Your Screen Savers OS X includes a dozen screen savers in the Desktop & Screen Saver System Preferences panel. But what you see there is just the tip of the iceberg. There are many sources for additional screen savers, most of which are free. You can find more screen savers on Apple’s own site, for instance. There’s also a fairly detailed list available on pure-mac.com, and if you’re running Mac OS X 10.4, you can download your favorites from this amazing collection of Quartz Composer screen savers. But even if all these choices still fail to thrill you, check out ShuffleSaver (free, though a donation is requested). ShuffleSaver can load your favorite images from iPhoto, or for a truly dynamic screen saver, Flickr.com. For instance, you can specify what tags to look for on Flickr, and ShuffleSaver then connects to Flickr and displays images that match your chosen tags. A warning, however: Since you’re never sure what images ShuffleSaver might find on Flickr—and how appropriate they may be—this might not be an ideal option for your computer at work. Brighten Things Up with Color While too much color can be overwhelming— Brady Bunch , anyone?—a splash of color here and there can really make things stand out. Take the Finder. There are a couple ways to use color to good effect to make it easier to find things. First, you’re probably familiar with labels—Control-click on any item in the Finder, then pick one of the seven colors in the Color Label section. Presto—instant attention grabber. Use this feature sparingly, and important features will leap right off the screen at you. Overdo it, though, and your Finder windows will start looking like someone got loose with a multi-color paint gun. You want to use labels only on those things you need to stand out, not everything in sight. Customizing the colors and the labels of key files and folders helps make important items easier to find. 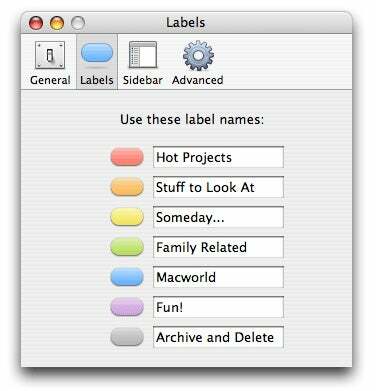 You can also customize the labels assigned to each color in the Finder’s Preferences. Click on Labels, then change each of the color names to something more relevant to you. On my machine, for instance, Red became Hot Projects, Orange turned into Stuff to Look at, and Gray is Archive and Delete. To apply color to a Finder window, make sure the window is frontmost by clicking on it, then select View -> Show View Options, or press Command-J. When the View Options palette appears, make sure that the This Window Only radio button is checked—unless you really want to apply your changes to all folders. In the Background section, click Color then click on the small white swatch that appears. Pick your color, then click OK.
You can even put an image behind your icons, if you wish. In the View Options palette, click Picture and navigate to the image you’d like to use. For readability’s sake, you’ll want a generally simple picture, and one large enough to cover the window at the largest size at which you’ll use it—otherwise OS X will tile your picture, which looks really bad. Use Different iTunes Visualizers iTunes default visualizer—the eye candy you can watch via the View -> Turn on Visualizer menu—is pretty nice. However, it’s not your only visualization option; there are a number of third-party iTunes visualizers available that install easily and are fully supported within iTunes. 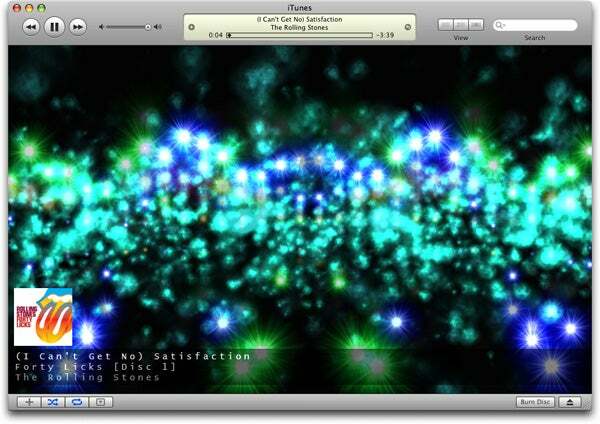 If you find the built-in iTunes visualizer somewhat boring, try one of the many free or low-cost third party alternatives. Here Eyephedrine Visualizer puts on a dazzling light show to a Rolling Stones classic. Two of my favorite free visualizers are Gaslight, a spectrum analyzer with some lovely presets, and iVisualize, which uses Apple’s Quartz Composer and provides more visualizers via download. If you’re willing to spend a bit of money, $8 gets you the amazing Eyephedrine Visualizer, which includes 75 great looking visualizers.